KATHMANDU, Jan 19: Deputy Prime Minister and Finance Minister Krishna Bahadur Mahara on Wednesday unveiled Immediate Implementation Action Plan, aiming to boost development spending. But the action plan, in many places, has promised to establish agencies or complete tasks on back dates, which could be sheer negligence on part of the government or mere copy paste of the earlier action plans. “The government plans to spend at least 80 percent of the capital budget with the implementation of the Immediate Implementation Action Plan," Mahara said, unveiling the document at a press meet at the finance ministry on Wednesday. If the line ministries do not approve programs within the first four months, they will not be authorized to spend the budget, Mahara said, adding that the officials, who do not provide enough staff and technical manpower to the projects, will also be punished. "The ministry will deploy a Rapid Monitoring Team for monitoring of mega projects," he added. The government has not been able to increase capital expenditure due to its eroding institutional capacity. By the end of the first half of Fiscal Year 2016/17, the government agencies have been able to spend only 11.30 percent of the total budget allocated for development spending. According to the Financial Comptroller General's Office, the government has been able to spend only Rs 35.25 billion of the allocated Rs 311.94 billion in the first six months o the current fiscal year, lower than the average spending of around 14 percent of the capital budget by the end of the first half of the fiscal year. However, the finance minister has claimed that the government will form a separate agency to implement mega projects including Budhigandaki Hydropower Project, Kathmandu-Tarai Fast Track, Second International Airport, Postal Highway, Smart City, Health Insurance and Social Security, and also to institutionalize the mechanism for mega projects. But Mahara neither elaborate on the modality of the agency, nor explained how the agency will work. He simply claimed that the agency will be formed within January 15. But there has been no sign of such agency even though it's already January 18. This gives enough room to doubt the implementation of programs outlined in the action plan. The action plan -- filled with popular slogans and no better than the earlier ministers' paperwork -- has also claimed to cancel the agreements with contractors that have been slow in implementing projects. "Such contractors will be blacklisted and deemed ineligible to bid for government tenders again," it reads, adding that the ministry, now onwards, will select only the projects that have undergone the 'Project Readiness Filter'. 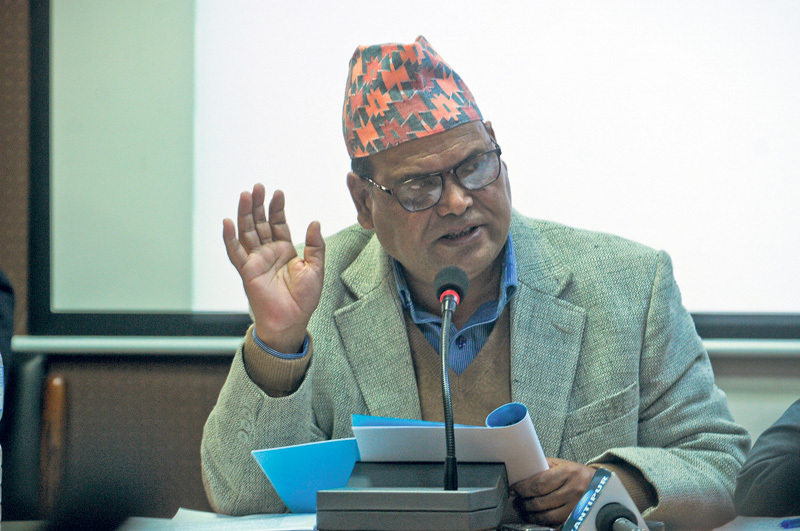 Though, Mahara himself is not convinced about the immediate implementation of his Immediate Implementation Action Plan, he said that it would help change the mentality of the bureaucracy as they have been working under a tunnel of laws and rules. "For development, we have to envision some methods that can implement projects in a fast track mode," he added.